Sadly Ana passed away on November 6th 2017. Ana’s family, wish for this website to stay up for the foreseeable future. News and updates of events and work relating to Ana and her work will be posted here from time to time. Maggie Watson of the Oxford Dance Writers has written a review of ‘Ana’s Time’ an evening of Ana’s work held on her birthday 2018. You can read it here. Ana is an independent dance artist/choreographer with a background in art and a wide range of dance styles. Since 1994 she has specialised in Butoh and improvisation performing in UK and Asia. Work includes theatre, site-specific, cross art collaboration and dance film. She has performed in a diverse range of venues besides theatres from churches, pubs, studios, streets to gardens and art galleries. Her films have been screened as part of Dancin Oxford and in Oxdocs International film festivals at Playhouse, Old firestation, Phoenix, Penultimate Picture Palace, castle walls. Ana regularly teaches and choreographs with Café Reason Butoh dance theatre (www.cafereason.com). She has also taught for Anjali open classes for learning disabled adults and children, choreographing pieces for galas at The Mill Banbury and Headington Theatre; and for the charity Crisis teaching dance to homeless and vulnerably housed people. She is currently offering classes for dance for older people. Ana is committed to creating opportunities for dance and is an active member of The Oxford Dance Forum. She has also set up regular sessions for cross art collaboration, choreographic development and organised informal platforms for works in progress by café reason and other dancers and artists. In 2011 she received Lottery support through Arts Council England for development of her work exploring light, film and the ageing body. In 2012 she was selected to be one of the supported artists in the ODF ‘Homebed’ scheme. In 2013 she trialled the first part of a new work ‘Inertia’ in collaboration with dance and digital artist Naomi Morris in ‘Moving with the Times’ as part of Dancin’ Oxford festival. 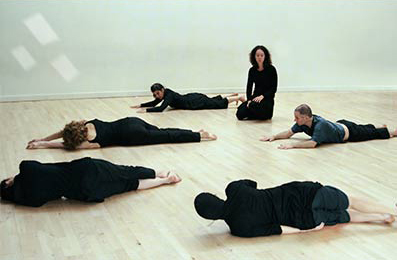 In 2014 the launch of regular professional development opportunities with Choreocollective and Meeting Points. I believe in the power of the body to inspire, create magic and communicate. The body in Mind: Reflections on research Embodiment. Body and Being Network. Oxford. Living in Lyon and studying contemporary dance with Claude Mazodier. Dancing with two different groups of fantastic busking African musicians during that year. Dance busking solo for the first time in streets of England and Ireland. Living in Malaysia where I studied Indian classical dance (Odissi) with Geetha Shankaran-Lam at The Temple of Fine Arts and first studied and performed Butoh with Lena Ang as part of Taro Dance Theatre with Palani Naryanan and Janette Hoe. Living in Indonesia where I watched and absorbed Javanese and Balinese traditional dance and music and practised regular movement meditatations with Susanna Miranti. Fortunate to experience opportunities created by Pak Prapto at Lemah putih with contemporary practitioners of Indonesian dance, theatre and music. Work with Cafe Reason -performing, teaching and co-directing projects. Collaborations with improvising musicians through Oxford Improvisors -especially with Bruno Guastalla and Malcolm Atkins.